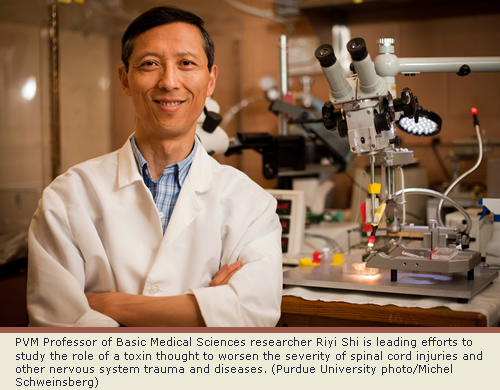 Purdue Veterinary Medicine Professor of Basic Medical Sciences Riyi Shi says a medical test previously developed to measure a toxin found in tobacco smokers has been adapted to measure the same toxin in people suffering from spinal cord injuries and multiple sclerosis, offering a potential tool to help in reducing symptoms. The toxin, called acrolein, is produced in the body after nerve cells are injured, triggering a cascade of biochemical events thought to worsen the injury's severity. Acrolein also may play an important role in multiple sclerosis and other conditions. Dr. Shi, who holds a joint appointment in the Weldon School of Biomedical Engineering, says, because drugs already exist to reduce the concentration of acrolein in the body, being able to detect and measure it non-invasively represents a potential treatment advance. The toxin is present in tobacco smoke and air pollutants. A method had been developed previously to detect and measure acrolein in the urine of smokers, but it has not been used in people suffering from conditions in which the body produces acrolein internally. "If the acrolein level is high it needs to be reduced, and we already have effective acrolein removers to do so," Dr. Shi explained. "Reducing or removing acrolein may lessen the severity of symptoms in people who have nerve damage, but there has not been a practical way to monitor acrolein levels in nervous system trauma and diseases." He added, "Due to widespread involvement of acrolein in the body, the benefits of this study have the potential to significantly enhance human health. For example, there is evidence that heightened levels of acrolein could diminish an individual's ability to recover fully from stroke and cancer." Dr. Shi is working with Bruce Cooper, director of the Metabolite Profiling Facility in the Bindley Bioscience Center of Purdue's Discovery Park. New findings are detailed in a research paper that recently appeared online in the Journal of Neurotrauma. To see a complete news release about the research, click here.